With under-floor heating the heat is where you want it - around you! The warmest part of an under-floor heated room is the floor and the area immediately above it.The temperature gradually decreases towards the ceiling. Conventional radiators create warm air that rises to the ceiling only to drop downwards again as a cool draught around your feet � convection heat. Under-floor heating systems provide a much more appropriate pleasant warmth and only produces a very gentle air circulation which varies only slightly from floor to ceiling � radiant heat. Control is the soul of under-floor heating. By using a combination of high quality thermostats and a Logic Controller, we can give you full zone control over every room, which in turn helps to save you money and the environment. By being hidden under the floor this way of heating gives unlimited new possibilities for furnishing buildings. A well-installed system is virtually maintenance free. Glenview Heating is able to supply you with a full range of high quality components. Ranging from underfloor pipe polyethylene, manifolds, Quicktrac rapid clip system to digital thermostats and timer modules. Below you will find a selection of our high quality under-floor heating components but there is much more so please contact us with your requirements and we are sure that we will be able to offer you a good solution. 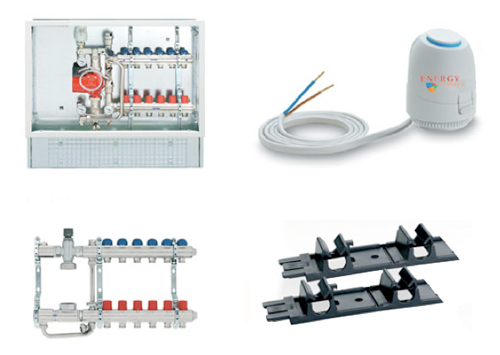 Manifolds with mixing kit pump and wall inset box Actuator - Thermoelectric Valve Controller Manifold with Mixing Kit, Glenview Heating Quickrack, Multi-layer composite pipe. The pipe we use is of an excellent quality and consists of an inside and outside layer of polyethylene of raised temperature resistance (PE-RT) which is tightly bonded to the mid layer aluminium 0.2mm core: welded � horizontal-roller-position. Inside and outside layers are of special PE composite. Hygienic, toxic free and smooth, it�s middle layer of aluminium is 100% gas/oxygen proof, giving it massive advantages over both metal and plastic pipe. Glenview Heating gives you full control. Control is the soul of under-floor heating. By using a combination of high quality thermostats and a Logic Controller, we can give you full zone control on every room. This means that when a thermostat calls for heat the signal it sends can switch on the boiler or heat pump and route the warmed water to each of the floors independently. This is the ultimate in control. We use a Full Programmable Timer/Thermostats which have a setback feature, 7-day timer/thermostat setting for individual day and temperature control.